Contemporary design, direct sea access and an infinity pool at this stunning villa on Lefkada. The sleek cubist design of Penio makes the very most of its stunning panoramic position on the south coast of Lefkada. Walls of floor-to-ceiling sliding glass doors flood the interiors with light and views and create an effortless indoor-outdoor experience. This synergy between the house and its surrounding terraces is mirrored by that of the pool and the sea, which are linked not only by the infinity effect of the former, but also by an umbilical pathway connecting the two. Inside: the main entrance takes one into a hallway off which one may access all areas of the villa. To the left are the sleeping quarters, while to the right, past a guest bathroom, a few steps lead down into the large, bright and extremely panoramic open-plan living area and kitchen-diner. 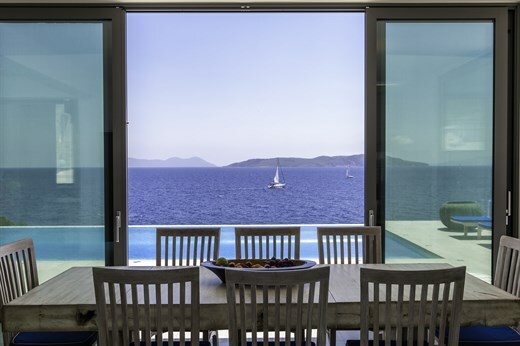 Floor-to-ceiling glass sliding doors on three sides ensure not only that the superb sea views are omnipresent, but also that the large pool terrace and the al fresco dining and barbecue zone can be accessed with complete ease. The kitchen is top-notch, both in terms of its facilities (think gas and induction hobs, a double-size fridge, etc.) and its position, which allow cooks to take inspiration from the sea views. The double height ceiling of the living area is traversed by a floating gallery, accessed via a flight of stairs near the entrance and leading to a pair of incredibly panoramic roof terraces. Heading back past the main entrance, a few stairs lead down to the main sleeping quarters, comprising two double-twins with en-suite shower rooms and the master double bedroom with en-suite bathroom with tub. All three have sea views and access to the main pool terrace. Accommodation is completed by an independent suite accessed once more via a few steps from the entrance hall. Here there is a cosy living area, a bedroom with small kitchenette, an en-suite shower room, garden views and access to a private terrace. Outside: Penio is surrounded on three sides by sea-facing terraces, which offer stunning views across the Ionian waters to Lefkada's neighbouring islands (Ithaca, Cephalonia and the tiny island of Oxia, recently purchased by the Emir of Qatar) and the Greek mainland. Running along the front of the house, and accessed from the open-plan living area and kitchen-diner and three of the bedrooms, is the main terrace, featuring an infinity pool of two halves, bisected by a walkway that connects with the steps down to the transparent sea below. To one side of the house, just outside the kitchen-diner, is a shaded al fresco dining and barbecue area, while to the other, just round the corner from the shaded section of the pool area, is yet more sea-view terracing and an outdoor shower. The independent suite also has its own patio area to the side and rear of the house. Last, but certainly not least, are the two roof-top terraces, accessed via the floating gallery above the living area. Here the views just get better and there couldn't be a more dreamy spot for an evening aperitif or a few sun salutations at dawn! Penio features a fantastic infinity pool, offering swimmers stunning views while in the pool. There is a drop from the infinity edge (as well as a few others inside the property and around the grounds) so we recommend younger children are supervised by an adult at all times. Please refer to our general safety page if you would like more information about infinity pools and other features. Penio is situated in the southeast coast of Lefkada just a short drive away from the village, harbour and seafront tavernas of Sivota. Also within an easy drive of Penio are many sandy beaches, including those at Mikros Gialos and Vasiliki. Exploring the island of Lefkada, which is 35km long and 15km wide, is relatively easy in a week (if you can pull yourselves away from the views and pool of the villa!) and offers a great deal to see and do. The azure, transparent waters of the Ionian Sea are a real attraction and the varied coastline includes a host of golden sandy beaches and the dramatic white cliffs Cape Lefkatas on the southern tip. The wooded mountains of the interior, some of which rise to over 1100m, offer excellent walking, some truly beautiful scenery and a scattering of unspoilt villages where the way of life remains profoundly connected to the island's ancient traditions and customs. "The most relaxing, magical and peaceful holiday I have ever had! The villa had been carefully thought out, and the salt water pool, amazing sea access and incredible views just make it the perfect property!" From the minute we arrived it was a great experience. Penio was without doubt the best villa we’ve ever rented. Little touches like the photo book and shopping bag from the owners, and the Aqua di Parma toiletries made it a very special experience. We will be back! Our holiday was made a real holiday by the cooks, who cooked for us on three of our seven nights. It was an absolute treat. They arrived discreetly, created the most delicious food and left the kitchen immaculate. What a treat. They are brilliant. Penio was exceptional - the best holiday villa in years. We loved it, the view and the staff: the housekeeper and her daughter cooked us the most delicious dinners - my whole family adore them. We had a lovely time at Penio and the holiday was excellent. We loved the sea swimming and snorkelling off Penio and its amazing pool and location. We had a wonderful time at Penio. The villa was absolutely beautiful, modern and equipped with everything under sun, there are no words to describe the beauty of the place. The views are absolutely stunning, you can see the sea from everywhere whilst in the villa and around the lounge and dining area. The villa has its own access to a rocky beach where you can enjoy a swim. The highlight is the very large infinity pool which is perched up on a small hill overlooking the sea, absolutely fantastic. All in all we had an amazing holiday and we will definitely be using The Thinking Traveller team for our next family holiday. Penio is an outstanding property, fantastic. The house itself is beautiful but the views were wondrous! We felt like we were on a boat in the middle of the ocean. The in-villa cook was great. The food was delicious and the ladies engaging. The most relaxing, magical and peaceful holiday I have ever had. Everything inside the villa had been carefully thought out, and the salt water pool, amazing sea access and incredible views just make it the perfect property! It was exceedingly expensive and exceedingly good. I guess you get what you pay for!! Penio looks like it is owned by people who like to have fun which is nice. The pool is unbelievable and the whole design of the building stunning. It is very nice that a lot of food stuff are to be found at the property which felt very generous to guests a bit like you were friends staying rather that clients. The property and the locations are absolutely beautiful. A special mention for the cooks...they are really good. The modern design of Penio is striking. Its location is exceptional. We could not have imagined a more perfect view. The pool was absolutely magical. The kitchen equipment was of very high standard. Internet was fast and worked flawlessly. Filtered water (eliminating need for bottled) was welcome and we used it constantly.Sivota and Lefkada generally were a wonderful introduction to Greece. We absolutely loved the house and the position. The views were incredible. Villa magnifique conforme aux photos et site internet avec une situation et une vue dont on ne se lasse pas. La personne qui faisait le ménage tous les jours était tres bonne , discrète et avenante , une vraie perle. Le paysage autour de la maison était splendide, et la maison est très bien.